Tang Wensheng, the daughter of Tang Mingzhao, once Under-Secretary-General of the United Nations, is one of the top English interpreters in the history of new China's diplomacy. In 1971, she worked as English interpreter to Mao Zedong and Zhou Enlai, and hence began her diplomatic career. Tang Wensheng participated in the historic diplomatic talks between China and America. As one of the witnesses to Sino-US diplomatic development, she made a great contribution to communication between China and the outside world. Following in the footsteps of Ji Chaozhu, she became an outstanding English interpreter. During her term in the Ministry of Foreign Affairs in the 1960s-1970s she worked as the principal English interpreter in major foreign affairs for such leaders as Mao Zedong, Zhou Enlai and Deng Xiaoping. In 1966, she carried out simultaneous interpretation work in international conferences such as the Emergency Meeting of the Asian-African Writers. In 1971, she interpreted for China in the 26th session of the United Nations General Assembly. She worked as a Deputy Editor-in-Chief of China Daily, China's only English-language newspaper, in 1984. Then she became Secretary of Foreign Affairs of the Ministry of Railways. 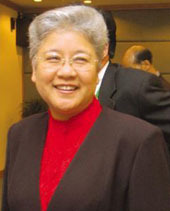 In 1999, she took the position of Vice-Chairman of the National Federation of Returned Overseas Chinese.